The district headquarter of the South Sikkim District is in ‘Namchi’ literally translating – ‘top of the sky’ and is situated at an altitude of 1,675 meters / 5500 feet above sea level. Anyone visiting West Sikkim has to traverse through the South District before entering the West. A slight distance above the alley ground is the Serdup - Choling Monastery which commands a panoramic view of the town and the mountains beyond. One of the interesting places to visit enroute to Namchi is the Bon Monastery at Kewzing, 5 kilometers from Ravangla which is the only one of its kind in Sikkim. 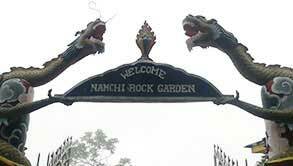 Namchi is about 78 kilometers from Gangtok & 100 kilometers from Siliguri. Tendong Hill - The name means ‘upraised horn’ from the Lepcha love relating the time when a great flood submerged their land and Tendong rose up miraculously like a horn to save them. Even today prayers are offered from the hill top before the on set of the monsoons to appease the deities and prevent a recurrence of the calamity. The place on the Samdruptse hill (The Wish Fulfilling well) opposite Namchi is believed to be a Dormant Volcano. By Air – Namchi is 100 kilometers from Siliguri. The closest air port is at Bagdogra, which is 105 kilometers from Gangtok and connected with all important Indian metros with regular flights from Kolkata, Guwahati, Delhi, etc. Helicopter / Chopper services to Gangtok from Siliguri and back are regular service. 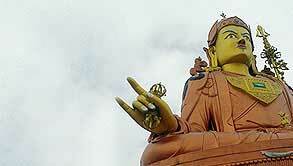 Mountain flights and other such tours to North Sikkim are also conducted. By Rail – Namchi is 100 kilometers from Siliguri. The nearest railhead is at New Jalpaiguri which is 108 kilometers from Gangtok. NJP is well connected with all major cities in India. At Gangtok, railway bookings can be made at the booking counter of the Sikkim Nationalized Transport Terminus. By Road – It is at a distance of 78 kilometers from the state capital Gangtok and 100 kilometers from the town of Siliguri, the nearest railhead and airport. Namchi lies off the road between Melli and Jorethang. Namchi is well connected to other towns in Sikkim and West Bengal. Jeeps and buses regularly ply between Namchi to Gangtok, Pelling, Jorethang, Kalimpong and Siliguri.